(1823-1918) One of the founding members of the society in 1868. ANDREW ELVINS (1823-1918) was a child of the industrial revolution; his life epitomized those qualifies of optimism, faith and perseverance which characterized many of his generation who rose from humble beginnings to achieve something of lasting importance. He was born near the Cornish mining town of St. Austell, and by the age of ten, his formal schooling evidently over, he faced a lifetime of drudgery in the tin mines. But a fascination with geology and a keen interest in the universe developed in his young mind. Apparent]y, he used to sketch the constellations as he saw them with his naked eye, and only later discovered, to his great delight, that they had names and were depicted in books, much the way he had drawn them. Elvins recalled that he and his school mates longed for a telescope, but the 25 pounds required for a 6 cm refractor was far beyond the resources of the school master or the boys. The bright side to the story is that Elvins' burning desire never faded, and through whatever opportunities he had for self-improvement, he was eventually able to realize his dream and to share his enthusiasm for astronomy with others. His young life took a turn for the better when, at age 12, he was apprenticed to a tailor, a trade which would give him employment for all his working life. During his seven-year apprenticeship, he read assiduously and attended night-school. At age 21, he emigrated to Canada, settling and marrying in Cobourg. On excursions to nearby quarries, he found and collected many fossils which led him to start a museum and a Mechanics' Institute in the town. For two years, 1858-59, the Elvinses lived in nearby Port Hope where he and a group of kindred spirits formed a scientific society. 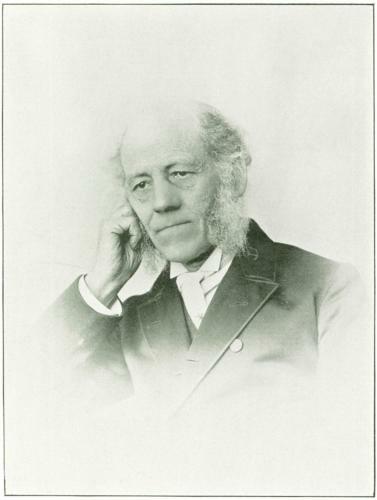 Moving to Toronto in 1860, he joined a large clothing firm called The Mammoth House on King Street East At the same time he became a member of the Canadian Institute, to which he contributed some of his best fossil specimens and before which he read several papers on archaeology, astronomy and meteorology. With only the evening hours free from work he turned more and more to astronomy, founding the Toronto Astronomical Club in 1868, and the Astronomical and Physical Society in 1884. He read widely in the library of the Canadian Institute, and corresponded with such well-known scientists as Cleveland Abbe and Norman Lockyer, and wrote articles for Toronto papers, The Leader, and The Telegraph, and an English journal, The Astronomical Register. He enjoyed viewing and sketching the Moon, planets and Sun and sometimes made observations of the aurora, solar halos and the zodiacal light. He was not content to stop there, however, but went on to concoct theories in which he took considerable pride. He claimed, for instance, that activity observed on Jupiter was evidence that material was still being ejected from the giant planet. and that satellites were even then being formed. When the fifth satellite was discovered in 1892, he took this as confirmation of his theory. He also believed that he had discovered evidence for two pulses of rainfall during each sunspot cycle, and was chagrined to see Lockyer subsequently publishing similar con- clusions without crediting him. Whatever we might think of his quaint ideas a hundred years later, there can be no doubt that Andrew Elvins was a driving force in the formation of our Society, and a very positive influence in encouraging others to pursue scientific studies. Andrew Elvins Genealogy, by Jim Low. Displaying 1 - 4 of 28 items (page 1 of 7).